Accurate local business citations can make or break a business! Citations, which are mentions of a business, usually online, often include the name, address and phone number (NAP) for the business, and sometimes will include a link to the business website. These citations are dispersed around the internet in the form of directory listings, map listings, reviews and much more. Citations are indexed by search engines and returned in search results when a consumer searches for a specific business, product or service. 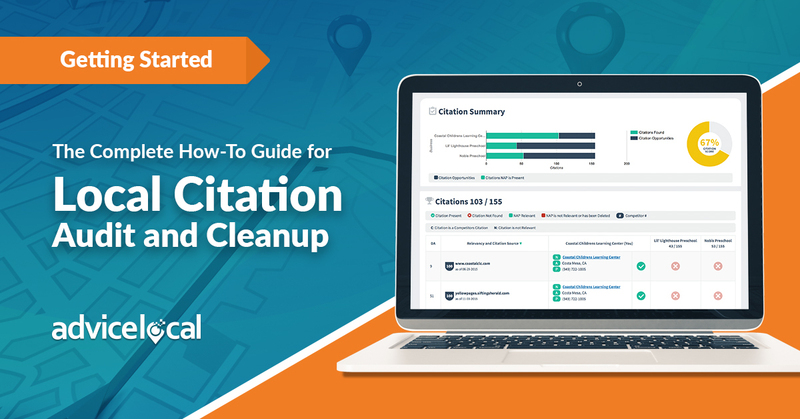 Download “The Complete How-To Guide for Local Citation Audit and Cleanup” and learn everything you need to know about citations today including how to clean them up! The majority of consumers start with a search engine when looking for products and services in their own geographic area. These searches can be via desktop, mobile or even by asking a device like Amazon Echo or Google Home. These smart devices can only return the results available to them, accurate or not. Siri, Alexa, Cortana and all the other methods consumers use to search are only as smart as the engines powering them! Sorry, but I have to get technical for a minute to explain how citations impact search results. Search engines index information on the web and return search results based on ranking factors. These ranking factors are influenced based on many different things, and two of those influencers are citations and NAP consistency. Search engine optimization (SEO) is a technique used to increase visibility on search engines. Local SEO techniques focus on helping local businesses place in search results for a specific geographic area. To place higher in local search results, businesses leverage directories, data aggregators, review sites, social media platforms and map listings. As mentioned at the beginning, these are local citations. When a citation is incorrect online, consumers and search engines lose trust! The simple fact is that bad data on the internet is a big deal and no business is immune, no matter the size. Here are just a few stats to back up why bad data should concern all businesses and brands. One of the questions we hear at Advice Local from business owners and some of their representatives are “Are online business citations really a big deal when it comes to getting customers into my store? I mean, after all, the majority of the listings about my business are correct.” Absolutely – and that’s the reason I created this local citation audit and cleanup guide. Within this guide, I’ll define what a citation is, why they matter, and the importance of citations for local businesses. Beyond that, I’ll dive into why it’s important to have clean data, how data gets corrupted and strategies to prevent corrupt data in the future. This guide isn’t just packed with whys, but also includes an in-depth how-to for finding all mentions of a business online and the detailed strategies for cleaning them up. This walk through focuses on which citations to clean up first, including the links you’ll need to get to the most importance sources. Once you work through that process, you’ll need to clean up the strays. I have included helpful how-tos on that also. The citation audit and cleanup process is neither quick nor easy, so be ready to get to work! You’ll need to carve out some time to complete a thorough audit and then start the citation cleanup process. Download “The Complete How-To Guide for Local Citation Audit and Cleanup Guide” and let’s get started today!